"Targets" is the total number of targets that are being received. "Filtered" are the ones that are visible due to your filter settings. This number indicates the number of targets that are filtered into your view. "Alarms" are the targets that are currently in an alarm state. 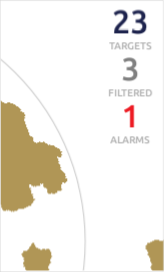 If filters are turned off or there are no targets in an alarm state then those counts will not appear. The target counts are shown on the plotting screen or on the associated mode buttons.